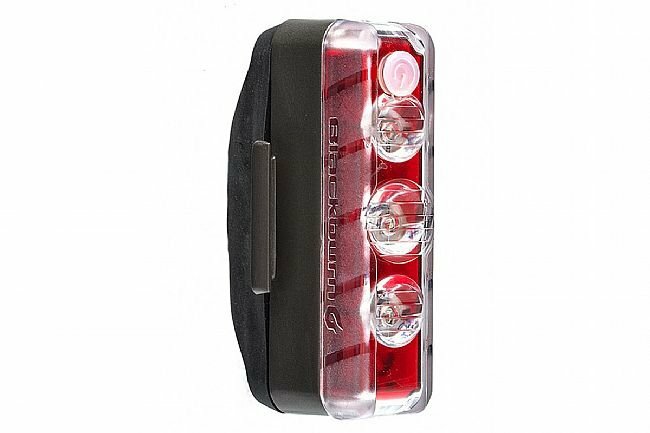 Blackburn's Dayblazer 125 Rear Light features 3 focused LEDs, 270 degrees of visibility, and a 125-lumen BLITZ daytime illumination mode. Its narrow profile and unique mounting backet allow it to be mounted to multiple locations on a bike, including aero seat posts, seat stays, a rear rack, and more. Equipped with an LED battery fuel gauge, its easy to monitor battery life: green = 100-75%; orange = 75-25%; red = 25-0%. 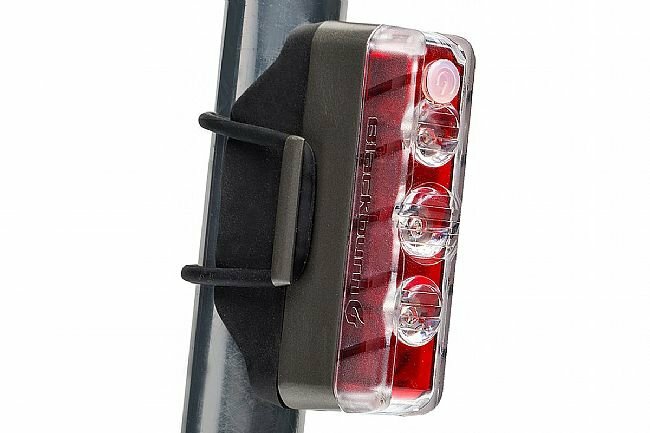 To make things even easier, this light can switch between a white 60-lumen front light and a red 20-lumen rear light by holding the button for 2 seconds and then pushing it again to select white solid, red solid, white flashing, or red flashing. Meets ANSI FL-1 Standard - output, run time, and water resitance. Front or rear illumination capable. Charging cable & 3 shims included. Runtimes: high solid - 1.6hrs, low solid - 3hrs; flash - 3hrs, strobe - 6 hrs. Dimensions: 85mm, 19mm, 75mm, including mount (H x W x D). Awesome light that I bought for the aero seat post on my Allez sprint. Immediately noticed cars getting further away from me when they passed me from the rear. A retina burner, love it!!! I bought this to replace a failed Lezyne Strip Drive Pro that failed. While I own a lot of Lezyne stuff, their engineering can be a little sub-par. The old light used to come apart when charging due to a poor tab design on the inner cover that did not hold. The Dayblazer was a similar light, looked better made and was cheaper so I gave it a shot. I made the right choice. The construction is first rate. Fit and finish are exceptional, with screws and gaskets to hold it together and seal it against the elements and good optical materials and design. The soft vee can mount on any bike from my deep aero seat tube to a round seat post, to my seat stay, and the metal clip underneath the Vee can go on bag or a back pack. Basically, it should work for nearly everyone. The light is very bright, probably excessive for night use, even on the low settings, but certainly attention grabbing even in bright sunlight. The usable angle is large enough vertically that it will be adequate on any angle of seat tube or stay. It is still bright well past 90 degrees, horizontally so you have excellent side visibility. The battery life is short for long rides except on the lowest setting, (6hrs), but it is so bright that I don't really plan to use any other than that setting anyway. 1) The button is a little hard to push. It seems a bit recessed and sometimes takes me several tries. 2) The elastic straps are basically just O-rings. If the light was to be left on the bike, this would not be an issue, but since the battery life is relatively short, and the unit must be removed to charge, a little more time should probably be spent to make it easy to install and remove. Luckily, the Lezyne light's strap fit perfectly and solves the problem for me. Although similar to the Lezyne, it appears to be a far better made, brighter, better side visibility, and it's cheaper too. Highly recommended. Excellent quality for the low price! This is the greatest daytime or dusk rear light I've ever had in my life. I upgraded from the taillights I've had for over 10 years. They were fine for almost dark riding but this flame can be seen during bright sunlight. Indeed it is a Dayblazer. It's got my back during harvest traffic out here in rural farm country. 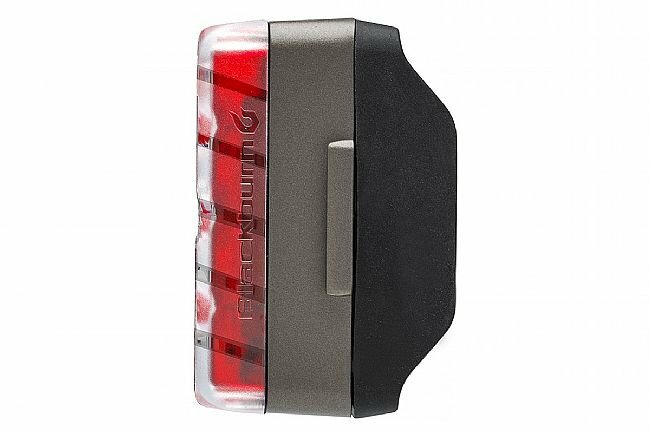 I bought this to replace a Planet Bike blinkie that i lost on a recent bumpy ride. I keep the light clipped to the back of my under-seat pack, my only real concern is being highly visible to motorists. I was completely happy with the old one, but in looking at replacements, i read that this one is brighter, and it sure is. I use the brightest flashing mode, and it's so bright that i can't look at it when i'm holding it! Seems very well built, clip is solid, being rechargeable is a must-have feature. Several settings, which is nice. Button could be a little easier to use, but thaty's not really a serious minus. I rated its value 5 star, even though it is a little pricey. For the sturdiness, brightness, and rechargeability, it is a great value. I would strongly recommend this if you're looking to be as visible as possible. I bought this light yesterday and it is fantastic. 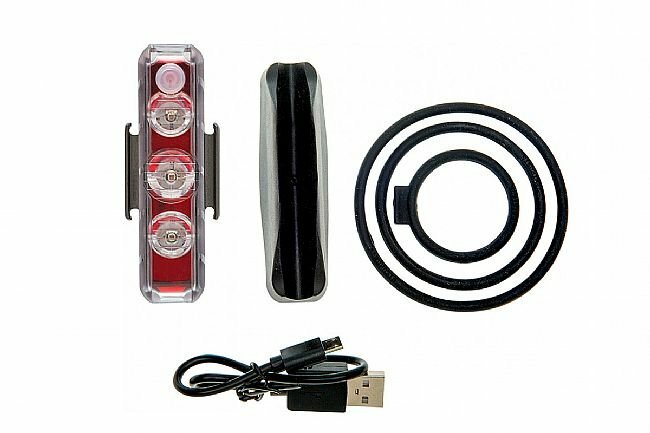 It is super brought easily charged and is very BRIGHT!!! It was recommended to me by a friend and it worth the extra money. I am not sure about the easy mount yet with black rubber cords in different sizes to fit anywhere on your bike but time will tell. I do recommend this light!